Eddie is studying Electrical and Electronic Engineering. 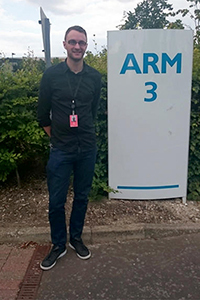 His summer placement was with ARM working within the Systems and Software Group. Studying Electronic Engineering, I’d heard a lot about ARM, a semiconductor and software design company, designing the IP which goes into 95% of smartphones, 80% of digital cameras, and 35% of all electronic devices. Recently described in an article as an “invisible brand”, given that most consumers of these products may not have ever heard of the company, my summer internship was always going to be a bit of a voyage of discovery! At the time of writing, I’ve only got a few weeks left of the summer placement and have been very fortunate to have been given access to some amazing resources and guidance from industry leading engineers. The experience I have gained from the various projects I’ve been working on in my role within the Systems and Software Group has been invaluable, giving me the opportunity to learn various new programming languages and top of the range industrial software with a market leader in their industry. My role has consisted of improving and automating various sections of the verification process, saving my colleagues time and effort on jobs which would usually have been done manually. The task of automating these processes has given me an understanding of the processes themselves, how they could be improved, and the various steps involved in improving them, giving me excellent opportunities to use my own problem solving skills. Being shown the improved accuracy of results of a regression analysis the week after making changes to a script provided me with great evidence that I was helping to make a positive difference within my team, after what felt like a fairly overwhelming start to the summer. I recently received some valuable advice about automating; always try and replace yourself with a script, there’s always more important things you can spend your time working on! This advice holds true to how I have perceived ARM’s philosophies; there is a strong emphasis on improvement and personal development. There have been a variety of ‘Lunch and Learns’ in which guest speakers talk about their field and the future of technology; the ‘Lunch’ occasionally leaves a little to be desired, but the ‘Learns’ tend to be inspiring enough to make up for that. As interns we were also given the opportunity to work in small teams on the ‘ARM Inten Innovation Challenge’, similar to the Global Engineering Challenge, we were tasked with coming up with a wearable device to improve life in a refugee camp, which was a great opportunity to use skills I’d developed with SELA. All in all, industry has also taught me many lessons that university life has not necessarily been able to: communication on a variety of different levels is integral to the success of a project; solutions to problems may not always be simple or even possible, as such trial and error and making mistakes are good steps along the way to producing a high quality and sophisticated solution; personal development and opportunities for education do not have to stop after university; and finally, 10PM is a perfectly reasonable bedtime when working a full time job!